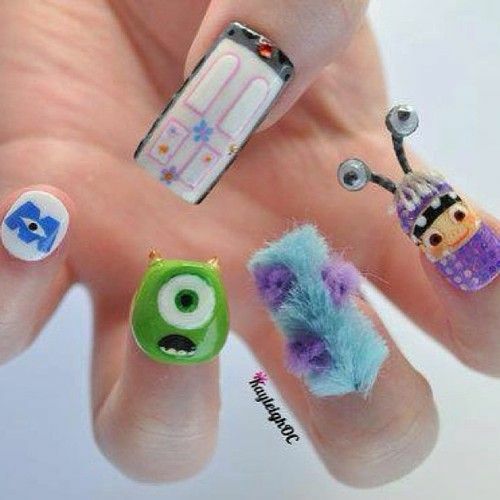 We gathered 5 surreal, mind boggling manicure designs that you probably haven’t seen before. We think these five experts have hit the nail on the head (pun intended). 1. Not looking to scare but hoping to get some stares? This Monsters Inc design is brought to you by Birmingham Media Student Kayleigh O’ Connor and with her use of detail and variety she’s captured some of the iconic character’s and logos from the film. 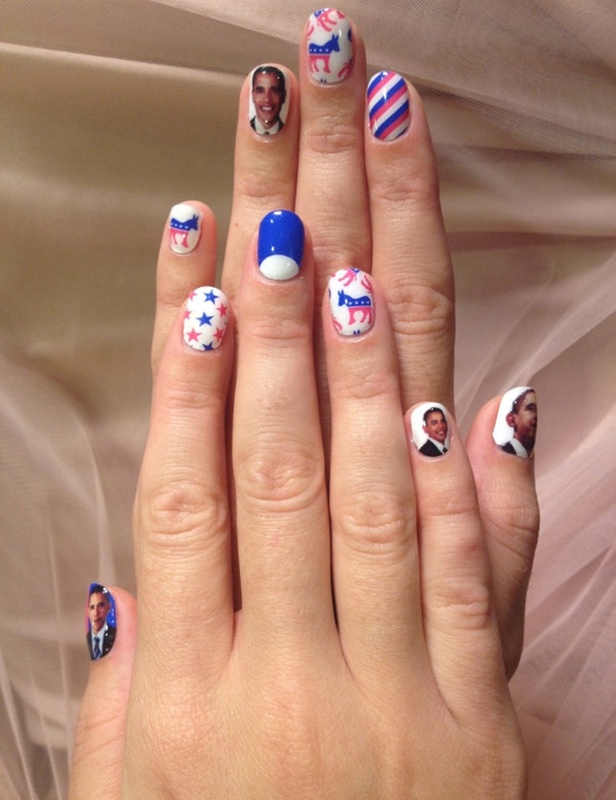 We’ve a feeling Katy Perry would be a fan of these as she knows how to work the kitsch style and having sported Barack Obama nails, she’s not afraid to let her finger tips do the talking. For this look you’ll need an array of nail polishes, some fine paint brushes, goggle eyes, furry material and some nail clue. 2. Make no bones about it…. 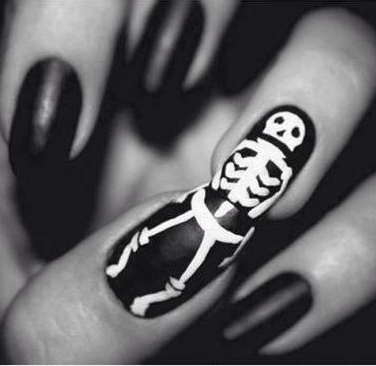 We could totally see ‘Smile’ singer Lily Allen rocking this hip Skeleton nail design! With only two polishes needed it won’t have you breaking the bank or any bones for that matter and it won’t take you until dawn, instead with it’s rough hand skeleton sketch you can be forgiven for being less than detailed. Nope, with this design you won’t need to know your cranium to your humerus; a few swishes and you’ll be done! 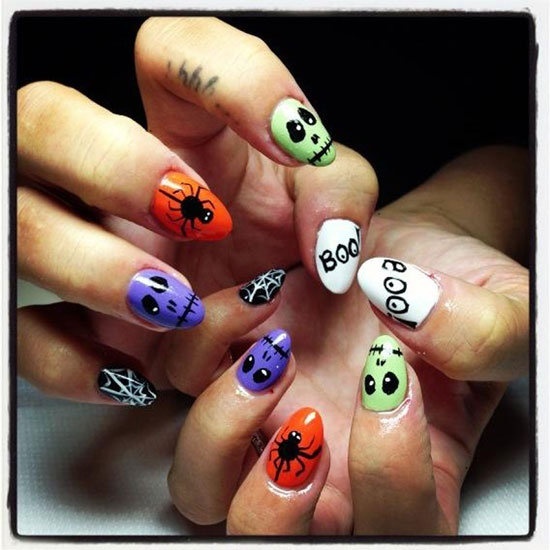 Below picture: Lily Allen has been know to decorate her talons for Halloween. 3. Booooooo! We think the owner of these nails could have taken inspiration from those spooky ghosts from the Super Mario Bros game and although not 100% needed we think these bad boys would look great painted on using a UV white nail polish. 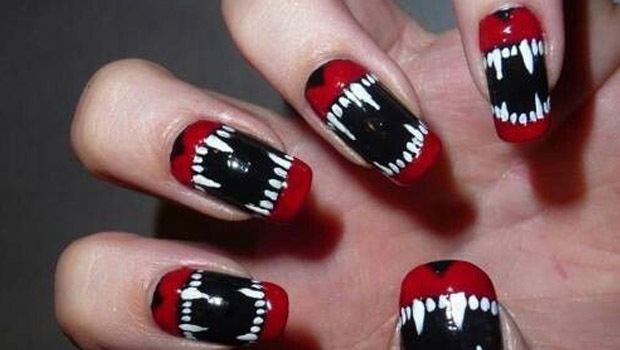 Another quick and easy design, we think these nails will look great at any Halloween party and we predict that nail addict Rita Ora would go for these ghoulish nails. Below picture: Rita always let’s her nails do the talking. 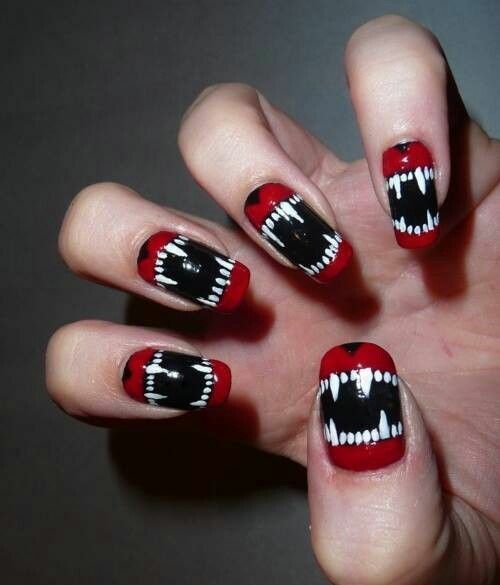 You’ll need some black nail polish, some glow in the dark polish and a clear varnish. For a credible glow in the dark polish, get your mitts on O.P.I Spookettes polish. 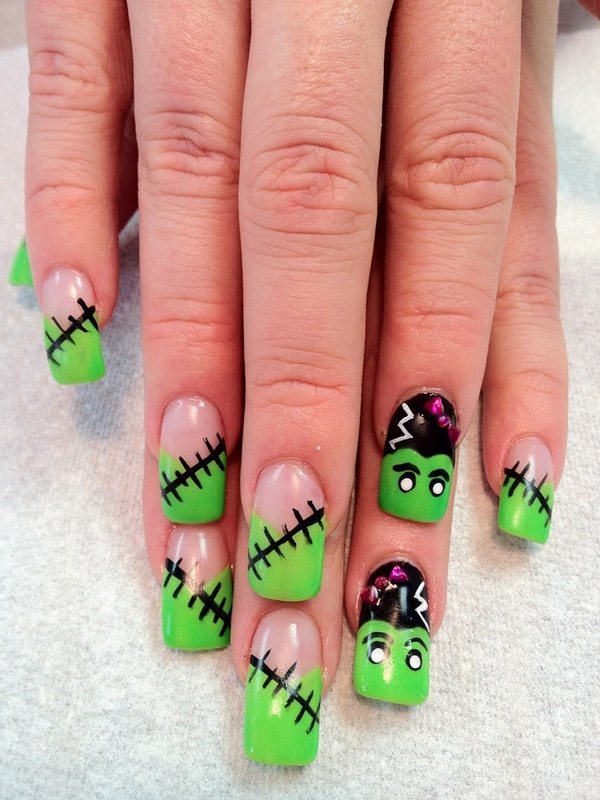 With this less than creepy but more cute and girly Frankenstein nail design. It’s not a stitch up to say that this nail design will win you some fans and if you’re looking for a tamer nail these diamante nails are more Casper the friendly ghost than Candy Man. We think with her love of body art and her knowledge of swagger that previous X Factor singer Cher Llyod would pull these off. We suggest O.P.I Gargantuan Green Grape for a bright and vivid base, you’ll also need some black nail polish, a clear top base polish, a thin paint brush and some coloured diamante gems of your choice. But be warned that you may need a steady hand or a friend to paint on those intricate fangs. The vamp nails will create ultimate damage when applied to a pointed or oval shaped stick on nail and we can definitely see the princess of rock Kelly Osbourne attaining this claw-ish design. 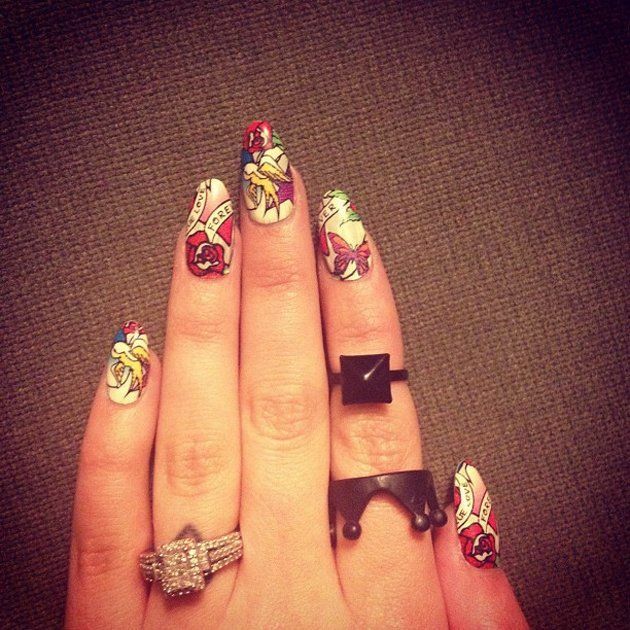 Below picture: Kelly Osbourne shows off her gothic nails.